WASHINGTON, D.C. -- Family Research Council (FRC) Action recently released its annual scorecard for the Second Session of the 115th Congress. 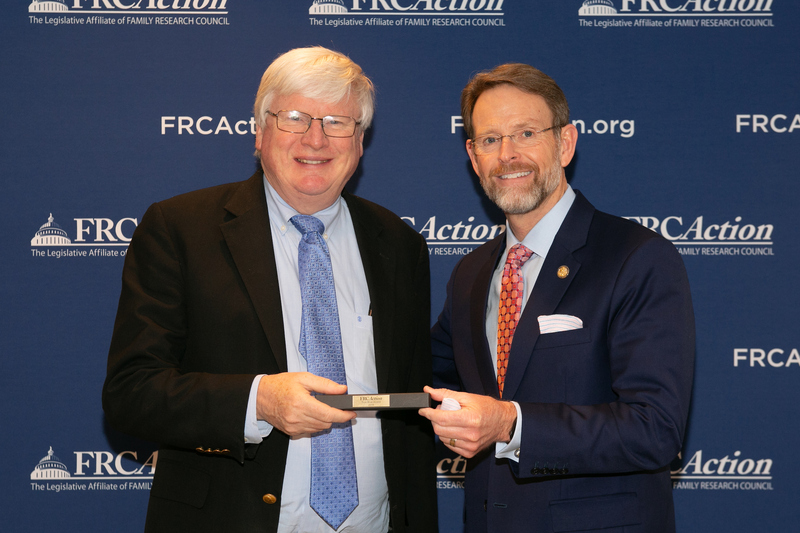 U.S. Rep. Grothman (R-WI-06) is among a new record of 276 Members of Congress who scored a perfect 100 percent for votes cast last year and received a "True Blue" award. On February 28 he was presented with FRC Action's "True Blue" award for displaying unwavering commitment and consistent support of faith, family, and freedom. "We thank Rep. Grothman for voting to defend and advance faith, family, and freedom. As a 'True Blue Member' he voted 100% on FRC Action's Scorecard including to protect babies who are born alive after a failed abortion, help hard-working families set aside funds for an unborn child’s future education, and defund the individual mandate in D.C.
"Rep. Grothman deserves praise for his unwavering commitment to stand for life, family, marriage, and religious liberty. Wisconsinites should be encouraged to know that they have a Member of Congress such as Rep. Grothman who has come alongside other members and our president to begin the work of rebuilding our nation, and protecting the very values that made America great," concluded Perkins.